There are many different components of a modern-day marketing strategy. Between social media and search engine optimization, an effective marketing strategy needs to be well organized and efficiently planned. However, knowing which digital marketing components are worth the effort can be challenging. When you only have so much time and money to allocate to your marketing strategy, you want your strategy to be as effective as possible. One of the most talked about marketing components is content marketing. 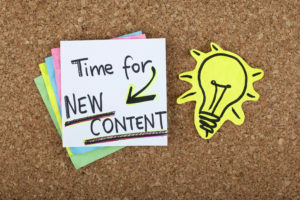 When done correctly, content marketing has the power to bring in new leads, convert leads into customers and keep those customers returning for more. But when executed poorly, it will bring in very little returns. Let’s take a look at what content marketing actually is and how effective it can be in promoting your business online. Content marketing is the process of promoting a business or brand through creating content to share on the web. One of the most common forms of content is blog posts. But, creating content also includes videos, infographics, images, webinars, podcasts and more. Companies frequently rely on content marketing to grab their audience’s attention online. Content can also educate, entertain, persuade, and otherwise nurture leads into making an educated purchase. After a lead converts into a customer, content can also help push that individual back into the sales cycle, encouraging them to continue business with the brand. Today’s customer is savvy about the way they interact with brands and advertisements online. While traditional ads are a great way to build brand awareness or remind customers that you’re there, they usually aren’t enough to convince a new lead to purchase. Instead, potential customers want to know who you are, what you offer, and why you’re worth their hard-earned cash. Marketing through content allows you to establish genuine connections with your target audience that encourages sales. Not only can you use your content to stand out from your competition and get noticed online, but you can also nurture your leads into becoming customers. Creating great content needs to go beyond engagements and search engine rankings. While both are important, an effective content strategy should be measured by conversions and how well you’re connecting with the individuals you’d like to do business with. If you’re simply posting for likes and shares, yet ignoring your returns, content marketing won’t be the investment you had hoped. To create an effective content marketing strategy, you want to create a plan that pushes your leads through your sales funnel. By creating content that speaks directly to their wants, needs, or problems, you can reap the benefits of a strong marketing strategy. When done correctly, content marketing can be one of the best promotion tools for your business. However, if you want to see real results from your content strategy, be sure to put time and effort into what you create. With the right content, you can establish long-lasting relationships with leads that keep them returning to your business again and again.